Sciblogs | Sunday Spinelessness – What’s brown and sticky? Sunday Spinelessness – What’s brown and sticky? Both the objects in that photograph are brown and fairly sticky, but the one in the background is a bit more interesting. That’s not a stick – it’s an insect doing a very convincing impersonation of a stick. 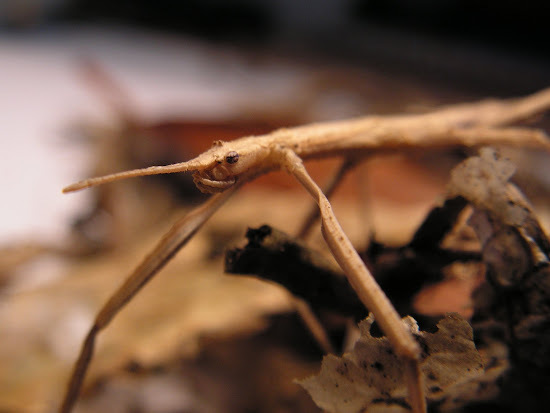 Stick insects ( ‘walking sticks’ in North American, Phasmatodea everywhere in the world) are among the most impressive mimics in the biological world. As you can see, their bodies mirror the tiniest details of the plants they live on – right down to having stems and buds. 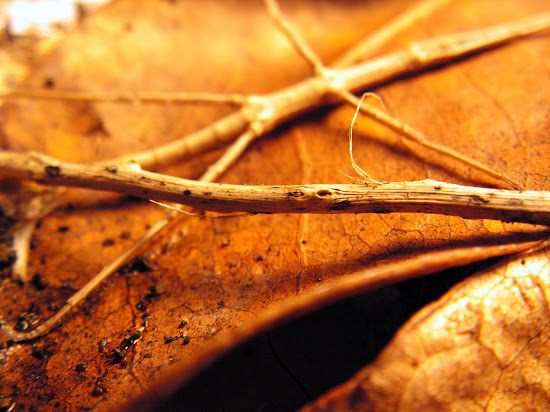 The stickyness of stick insects goes deeper than their remarkable appearence – they also act like sticks. The rigid pose you see above is the result of my disturbing this one while trying to take a photo. The insect was so dedicated to its role I could easily pick it up and place it on its leaf while it maintained its spread-eagle pose.